Introducing our latest product, The Geoconnect Shear Dowel Connector. This is a unique CE marked product that is designed to carry large loads across expansion and contraction joints in concrete structures safely and efficiently. The Geoconnect Shear Dowel Connector has excellent mechanical properties, for instance; it has a high resistance to corrosion which is a necessity in construction as maintenance work is not possible once cast. What's more, The Geoconnect Shear Dowel Connector is available in both Stainless Steel and Mild Steel HDG. Click to read more and to download the ETA approval sheet and brochure. 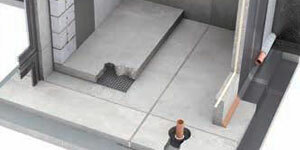 Steel reinforced concrete foundations vary greatly due to the technical requirements of each project, all shapes and dimensions of ground beams, pile caps, lift shaft bases etc can be different. In short, Corriform is a high-performance corrugated polypropylene shuttering system which combines the benefits of permanent formwork with protection against contaminated ground. TJEP ULTRA GRIP re-bar binder increases your efficiency significantly compared to the physically demanding, monotonous and time-consuming work of manual tying. TJEP ULTRA GRIP is the third generation of re-bar binders from TJEP and is a further development of our popular XP re-bar binders. The know-how gained from previous generations has been incorporated into the new ULTRA GRIP series, which sets new standards in tying speed and quality. As buildings get more complex and challenging - both technically and architecturally, RFA-Tech as a supplier to the construction industry continually strives to innovate and introduce new products to meet this demand. We are pleased to announce that all our credit account holders will be able to gain access to the Customer Portal. At RFA-Tech, we are always looking for new ways on how to improve the life of our customers, whether this is coming up with new technical solutions on how to im­prove existing features, or coming up with new elements altogether. We believe the Customer Portal is a crucial part of ensuring our customers needs are met. To find out more, click the "More Information" link. 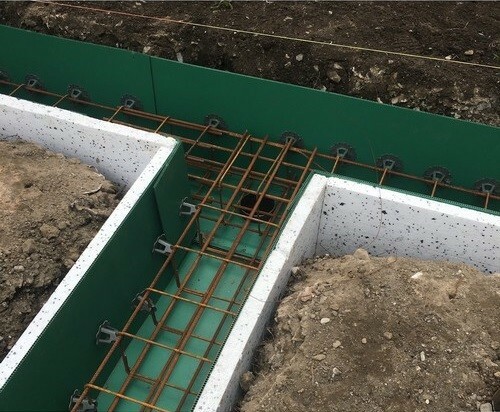 The concept and use of reinforcement continuity strip or ‘pull-out bar’ systems has been widespread in Europe and further over the last 30 years, and is a widely accepted means of providing reinforcement continuity across construction joints in concrete. 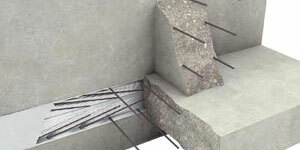 The system utilises the concept of overlapping reinforcement to provide a connection. The Startabox System consists of specially selected, high yield reinforcing steel, housed in a fully perforated and hot dip galvanised carrier unit, with the ends sealed to prevent the ingress of concrete. 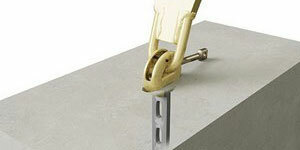 The reinforcement used is CARES Approved and cut and bent to conform to BS8666. The system is assembled in a BS EN ISO 9001 factory environment and the full system carries a CARES Technical Approval. 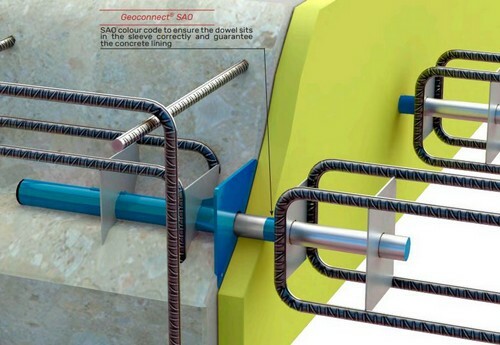 The product design ensures fast and easy faxing by nailing to the formwork or tying to the existing reinforcement. Bars are quickly bent out using the specifically designed re-bend tool. When compared to traditional methods, the product offers a cost saving by means of a less labour-intensive installation process and a simplification of formwork. 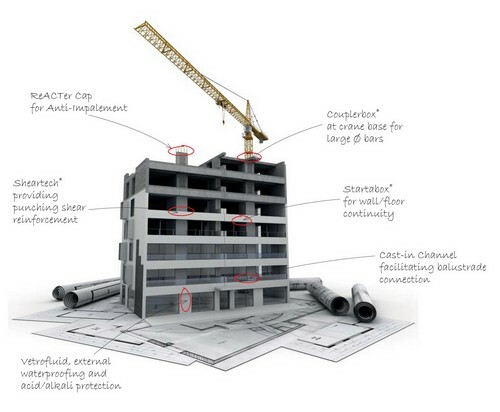 The use of flat slab construction has become increasingly popular in the construction of concrete frame buildings. Flat slab designs bring many benefits; however, locailised high shear stresses around column heads can be seen in these designs, and if additional measures are not taken, the weight of the slab can result in the column punching through the slab. 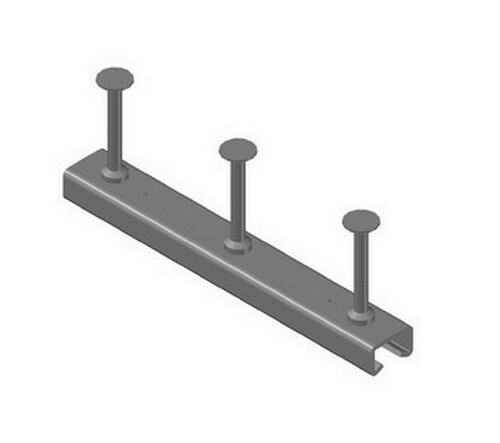 Traditionally, adding further reinforcement in the form of loose shear links around column heads has been used as a measure to resist punching shear, but these links are time consuming and labour-intensive to install and design. The RFA-Tech Sheartech™ System offers a method of providing punching shear reinforcement with a CARES Technical Approval. The system is fast to install with all component parts prefrabricated to allow simple and accurate placement. To assist in the calculations and design work an engineer must do to specify the correct design, RFA-Tech Ltd offers free design software capable of designing punching shear reinforcement to Eurocode 2 standard in a matter of seconds. Follow the link below to access the software. The Couplerbox is a combination of the Startabox perforated case assembly and rebar coupler system, in a single unit. The system was initially developed to offer a reinforcement continuity product for the areas where a rebend system was being specified, but in a larger bar diameter than possible to produce. Without the requirement to re-bend reinforcing bar, diameters of up to 32mm rebar can be produced in the Couplerbox system. It has also been used to solve the problem of locating rows of individual coupled bars especially with the use of some types of moving formwork systems such as slipform rigs. 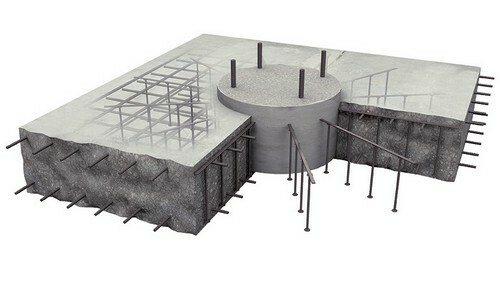 Coupled bars can become easily displaced and slip back from the concrete surface making location and preparation for future use a time-consuming and costly process. The introduction of the Eurocode 2 building regulations has now seen a requirement for much longer lap lengths; making the use of couplers more economical due to the restrictions on the manufacturing possibilities of re-bend continuity systems. RFA-Tech offer a range of CE marked Cold Rolled Anchor Channel Systems and T-Head Bolts for the safe and secure anchoring of structural components into reinforced concrete. All channel profiles are backed by extensive testing, European Approvals and in some cases by CE Accreditation. Cast-in channels are a proven and well respected connection system for carrying tension and shear loads. They can be cast into the compression and tension zones of concrete, are easy to install and allow maximum flexibility and buildability on site. 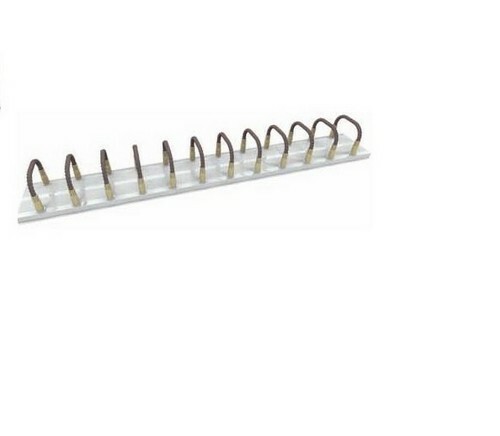 The channels are provided in mild steel HDG or Stainless Steel with anchors at a maximum of 250mm centres and are supplied in short pieces or long lengths to suit the application. All profiles are filled with expanded foam which is easily removed after the concrete is poured to allow for the T-bolt insertion. In addition, an innovation by our manufacturing partner has led to the development of the Smart Anchor Channel. The combination of cold rolled channel plus a 'smart plate' tested ay Milan University, produces shear loads in excess of those only obtained previously using a hot rolled profile. We supply a comprehensive range of concrete accessory products, most of which are available in stock for next-day delivery throughout the UK. We design, manufacture and supply a wide range of products for reinforced concrete structures, many of which hold CARES Technical Approvals. We supply an extensive range of precast lifting and fixing products and systems for concrete manufacturers, with CE Approval for all relevant products. We currently have a vacancy located in Lichfield within our Commercial Team, as an Internal Sales Advisor. 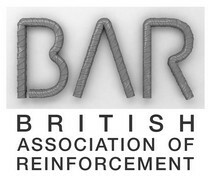 British Association of Reinforcement (BAR) members! RFA-Tech are now a member of BAR and feature in the Reinforce 2018 brochure which is available to download within the article. 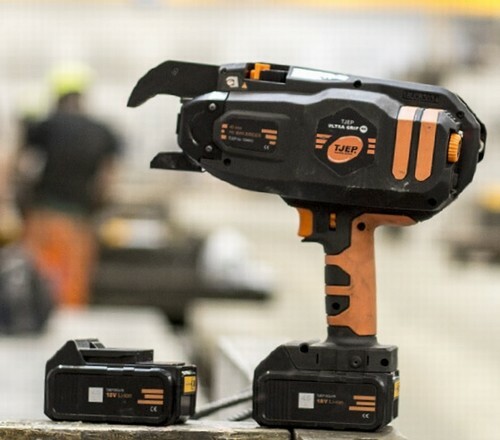 Established for over forty years as one of the UK''s leading specialist construction accessory suppliers, RFA-Tech has built-up an enviable reputation for providing a wide product range together with a rapid and efficient service.